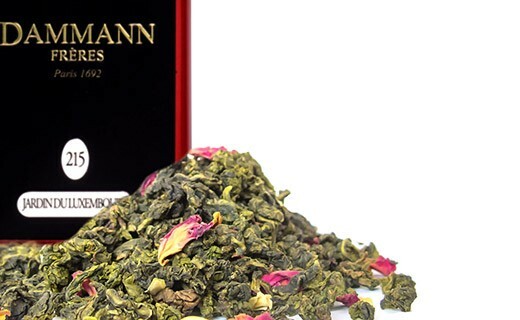 This Tea Jardin du Luxembourg is a green oolong with sprinkles of jasmine flowers and rose petals, and with hawthorn flower, Aloe Vera, jasmine rose, acacia, water lily and plum tree aromas. Like a tribute to the most Italian garden of Paris, all seasons are united in this floral and delicate blending, allying temper and softness. In 1692, King Louis XIV granted to Sieur Damam the exclusive privilege of selling tea in France. This is the beginning of a long history that led Dammann Frères to set up trading posts around the world to trade teas from the finest gardens. 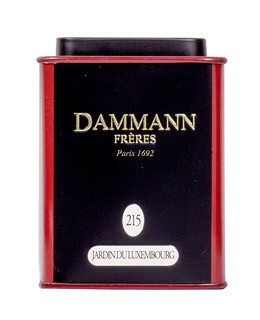 The expertise of Dammann Frères and the quality of their teas will make them the official suppliers of the Compagnie Generale Transatlantique (the famous and prestigious "French Line "). Today Dammann Frères perpetuates this expertise in selecting while inventing new flavors to maintain this ideal of quality and tradition. Infusion : 3 to 4 minutes.